Last month, the California State Assembly passed a resolution urging state educational institutions to more aggressively crack down on criticism of the State of Israel on campuses, which the resolution defines as “anti-Semitism.” The anti-democratic resolution is the latest step in the broader campaign to stifle and suppress dissent on California’s increasingly volatile campuses. The Palestinian Authority has formally asked Israel for talks on changing the Paris Protocol, a key agreement governing economic ties between the two, a minister told AFP on Sunday. “I made a request to the Israeli government through the defense ministry… that the Palestinian Authority officially requests the reopening of the Paris Protocol which is not compatible with the current economic situation,” said civil affairs minister Hussein al-Sheikh. Sheikh said he had been advised by Palestinian Authority president Mahmoud Abbas to push through the request, which comes as the Palestinian Authority is struggling to handle a growing wave of social unrest over the spiraling cost of living. “The president told me as head of civilian affairs to give the Israelis an official request to reopen the Paris Protocol — to re-examine it, to adjust it and to change it as soon as possible,” he explained. There was no immediate comment from the Israeli defense ministry. The Paris Protocol was a framework set up in 1994 which laid out the terms for the economic relations between Israel and the Palestinian Authority which was established as part of the Oslo Accords which created the PA.
That agreement is seen by several analysts as deepening Palestinians’ economic and social predicaments brought on by Israel’s successive occupations of 1948 and 1967, effectively dividing Palestinian living into cantons that greatly restrict mobility and trade. Also Sunday, Palestinian Authority prime minister Salam Fayyad, who has been the target of economic protests over the last three weeks, defended his neoliberal-style policies. Fayyad offered to resign Friday in response to the demonstrations. Three Palestinians tried to set themselves on fire as part of the protests in both the West Bank and Gaza. One man doused himself and his six-year-old daughter with petrol this week but was stopped by onlookers before he lit the match. The man was said to be unable to pay for his daughter’s cancer treatment. Another man died in the Gaza strip after setting himself ablaze beside a morgue at Gaza city’s Shifa hospital. “The goal of [the Paris Protocol amendments] is to provide for the Palestinian people within this difficult economic situation,” Sheikh said. BEIRUT, (PIC)– Jerusalem International Foundation demanded the international community to take necessary measures to stop the Israeli crimes of ethnic cleansing committed against the Palestinian citizens in the occupied city of Jerusalem. Yassin Hammoud, Director General of the Beirut based foundation, condemned in written statement the Israeli occupation’s procedures of deporting the Jerusalemite MP Ahmad Abu Tair from Jerusalem to the city of Ramallah, following his release after serving a year in administrative detention. He considered that the ongoing policy of the occupation of deporting the MPs and other Jerusalemites from their hometown represents a violation of the international laws and conventions. Hammoud affirmed that the Israeli occupation authorities have been always striving to deport the city’s leaders and icons in preparations to control the entire city. He stated that “the issue of Jerusalem’s MPs and former Minister is one among many other attacks committed by the Israeli occupation against our people in Jerusalem”. He appealed to Arab parliaments to seriously and effectively intervene and confront Israeli abuses, emphasizing on the Jerusalemite deportees’ right to return to their city. Jerusalem International Foundation’s director also called on the international community to take the necessary measures to force the occupation authorities to respect all international laws and conventions and stop its plans targeting Jerusalem and its residents. Family members of Palestinian prisoners have protested against the treatment of prisoners held in Israel. As many as 4500 Palestinians are currently imprisoned in Israel many of whom are on the so-called administrative detention that allows Israeli prisons to hold them for months without any accusations. Palestinian prisoners have been subject to human rights violations such as the use of torture during interrogations. Press TV has conducted an interview with Greta Berlin, co-founder of the Free Gaza Movement, to further discuss the issue. What follows is an approximate transcription of the interview. Press TV: We were watching there about the plight of the Palestinian prisoners. We’ll get to the Free Gaza Movement in the next section but let us talk about your experience in Gaza because when you were there in 2008 you would have met families who had prisoners in Israeli detention. Berlin: And we did, we met with the families when we were there. We met with them, we talked to them. Many of those people are still in prison. You are talking now what, four years later? They are still in prison. I mean Gaza is its own prison and it is an enormous injustice that many of them have no charges, they are thrown into jail. You have got children now who are in jail, who are 12, 13, 14 years old. What happened to them? They threw stones. Press TV: I think Greta what you would have seen firsthand and what you will know from speaking to Palestinians is the injustice on the families. Often we can say figures, 4700 Palestinians in prison and then people will say what did they do? Maybe they deserved it. What is the knock-on effect of 4,700 prisoners? Berlin: I think the hardest thing for all of us who met with those prisoners is to talk to their mothers, any of us who are mothers it broke our hearts. They sat there with the pictures of their sons. Many of whom they hadn’t seen in decades, a few of them and they didn’t understand, they could not understand why this was happening, why they couldn’t be released. I think that was the hardest thing for anyone who is a mother, was to talk to those mothers. Press TV: And of course the inhumanity of not being able to get any visitation rights at all which I don’t think is merit anywhere else so specifically in the world as an Israeli gets Palestinian detainees. But Greta I will be coming back to you in a couple of moments to talk about the Free Gaza book. Greta, this book is original and different from other things that have been written about the Free Gaza Movement, how? Berlin: Well it is different because it has got 24 voices in it and that was 24 voices out of the 44 people who went on board and also the people waiting in Gaza. So it is a kind of an anthology of how hard it was for us to put this project together, how patient the Palestinians were who were waiting for us in Gaza and then what actually happened to us when we got on board those boats because we were sick, our communications were cut off. Actually the book is very funny sometimes because for example we put the wheel on backwards on one of the boats. Press TV: So tell me about that, I remember I was on the Free Gaza and I would say when you steered left it seemed to go right and at one point it backed into a dock when it was supposed to be going forward. It was a floating joke. Berlin: Yes it was a floating joke, it was a floating shipwreck, it was a floating disaster, it was a floating piece of crap I think is what our Irish person said and we did not realize that. There was no body on those boats out of the 44 people. There were perhaps eight who knew what they were doing. The rest of us just got on the boat. Press TV: And people think it was just a 36 hour crossing which quite frankly we’ll get to in a minute with horrendous enough. But there were people on the boats for how long? Berlin: Well the boats because actually you are part of that, because the boats actually came out of Greece. The entire journey was 12 hundred miles long because the boats have been hidden in Greece. We had realized that the Israelis had blown up a boat in 1988 and had killed three of the organizers that was called the ship of return. So we wanted to make sure that those boats were well hidden. Well they were but they were just small fishing boats. They had to get out of the ports in Greece, go down to creek, come across the Mediterranean, go to Cyprus and then go to Gaza. And these are small fishing boats that were actually equipped for maybe eleven people. Press TV: And what sort of threats, did you encounter any threats? Outline those, what is in the book? Berlin: Well because I was in the charge of the media I got lots of threats because my phone number was posted. I remember one man just before we left, he called me up and he said do you know how to swim? And I said what? He said well do you know how to swim? I said what? And he yelled at me do you know how to swim? And I said oh, I am sorry you sound like you are under water. Now I thought that was funny because what happened to all of us is that we were so accustomed to being threatened, you were threatened, your children were threatened. We were so accustomed to being threatened that we started turning it into a joke. Press TV: Let’s remember these Zionist sympathizes, stooges,…people are paid to threaten activists trying to do good for the Palestinian cause. Isn’t that correct? Berlin: Yes and I am still being threatened. I mean when the book came out, it came out on Amazon and it has only been out for two weeks because it came out on the fourth anniversary of our sailing which was August 23rd. The vitriol of the Zionists that have written negative reviews about this book is amazing. In this Friday, Dec. 23, 2011, Iraq’s Sunni Vice President Tariq al-Hashemi speaks during an interview with the Associated Press near Sulaimaniyah, 160 miles (260 kilometers) northeast of Baghdad, Iraq. An Iraqi court found the nation’s Sunni vice president guilty Sunday, Sept, 2012 of running death squads against security forces and Shiites, and sentenced him to death in absentia. BAGHDAD — A Baghdad court sentenced Iraq’s fugitive Sunni vice president to death Sunday after finding him guilty of masterminding the killings of a lawyer and a government security official. Tariq al-Hashemi has denied the allegations. He fled the country after Iraq’s Shiite-led government leveled the terror charges against him in December. The politically charged case sparked a crisis in Iraq’s government and has fueled Sunni Muslim and Kurdish resentment against Prime Minister Nouri al-Maliki, a Shiite who critics say is monopolizing power. The Baghdad courtroom was silent Sunday as the presiding judge read out the verdict convicting al-Hashemi and his son-in-law of organizing the murders of a Shiite security official and a lawyer who had refused to help the vice president’s allies in terror cases. The court sentenced both men in absentia to death by hanging. They have 30 days to appeal the verdict. The judge said al-Hashemi, who is in Turkey, was acquitted in a third case linked to the killing of another security officer, due to a lack of evidence. The trial has fueled resentment among Iraq’s Sunni minority, and al-Hashemi himself has dismissed the charges against him as a political vendetta pursued by his longtime rival, al-Maliki. Sunday’s final session of the trial opened a window on the politically charged nature of the case. The defense team began its closing statement with a searing indictment of the judicial system, accusing it of losing its independence and siding with the Shiite-led government. “From the beginning and through all procedures, it has become obvious that the Iraqi judicial system has been under political pressure,” attorney Muayad Obeid al-Ezzi, the head of the defense team, told the court. The presiding judge interjected, warning that that the court would open legal proceedings against the defense team if it continued to heap accusations on the court or the judicial system. Iraqi political analyst Hadi Jalo said the verdict against al-Hashemi will help the embattled prime minster. “With this verdict al-Maliki will be stronger as it will strengthen his hands,” Jalo said. “The verdict, the most important since the trial of the Saddam Hussein who was hanged in 2006 with al-Maliki in office, will serve as a message to all that the government will not tolerate” misdeeds, he said. Some contested that assessment, while others agreed, splitting along sectarian lines. “I consider the whole trial and the verdict today as another farce to be added to the Iraqi judicial system since the Saddam Hussein trial,” said Abdullah al-Azami, a 45-year-old Sunni lawyer from Baghdad. “We were hoping to see an independent judicial system after 2003, away from the influence of politics and politicians, but we have found out that this is impossible,” al-Azami said. Khalid Saied, a Shiite pharmacist, differed. “I strongly support this verdict, and there many other people in prisons who should receive the same (death) sentence,” said Saied, a 40-year old father of three. “I call upon the government to air all al-Hashemi’s crimes on TV, so that the entire world knows him,” he said. The trial, which began last spring, featured testimony from the vice president’s former bodyguards, who said they were ordered, and then paid, to launch the attacks. Government forces who found weapons when they raided al-Hashemi’s house and that of his son-in-law also testified in the case, as did relatives of the victims. A spokesman for al-Hashemi said the vice president would release a statement later Sunday. Iraq’s Shiite-led government has accused al-Hashemi of playing a role in 150 bombings, assassinations and other attacks from 2005 to 2011 – most of which were allegedly carried out by his bodyguards and other employees. Most of the attacks the government claims al-Hashemi was behind targeted the vice president’s political foes, as well as government officials, security forces and Shiite pilgrims. The charges against the vice president span the worst years of bloodshed that followed the 2003 U.S.-led invasion of Iraq, when sectarian attacks between Sunni and Shiite militants pushed the country to the brink of civil war. Al-Hashemi has claimed that his bodyguards were likely tortured or otherwise coerced into testifying against him. PA Prime Minister Salam Fayyad meets Germany’s Foreign Minister Guido Westerwelle in Ramallah, September 9, 2012. RAMALLAH (Ma’an) — The ongoing protests against rising living costs in the West Bank prove the Palestinian Authority is committed to the right to freedom of expression, PA Prime Minister Salam Fayyad said Sunday. Fayyad made the comments while meeting with Germany’s Foreign Minister Guido Westerwelle in Ramallah. The Palestinian Authority prime minister briefed Westerwelle on the economic situation in the West Bank and ongoing Israeli violations of the Palestinian people’s rights, above all in Area C and East Jerusalem. He urged the European Union to pressure Israel to stop exploiting Palestinian resources in the West Bank and to end the 45-year occupation of Palestinian land. The German FM applauded the achievements of the PA in “laying the foundation for building an independent, self-reliable Palestinian state” and reiterated his country’s support for a two-state solution with East Jerusalem as its capital. Germany will continue to help develop the Palestinian economy, Westerwelle added. Fayyad appealed to donor countries to fulfill their financial obligations to the PA in order to pay the salaries of civil servants and to cope with the current financial crisis. Frustrated by rising prices and high levels of unemployment, Palestinians took to the streets this week to protest the dire economic outlook. PA premier Salam Fayyad, who also held the finance minister post until earlier this year, has emerged as a focus of the protests but insists that his policies have only been proved right by the economic crisis. “For years I insisted we gradually decrease our reliance on foreign aid,” he told Palestinian radio on Saturday. “Of course we would have got better results if we were able to lift the Israeli blockade on Gaza, cancel Israeli control and restrictions on the Palestinian economy…of course the continuing of the (internal political) split has increased the crisis,” Fayyad continued. 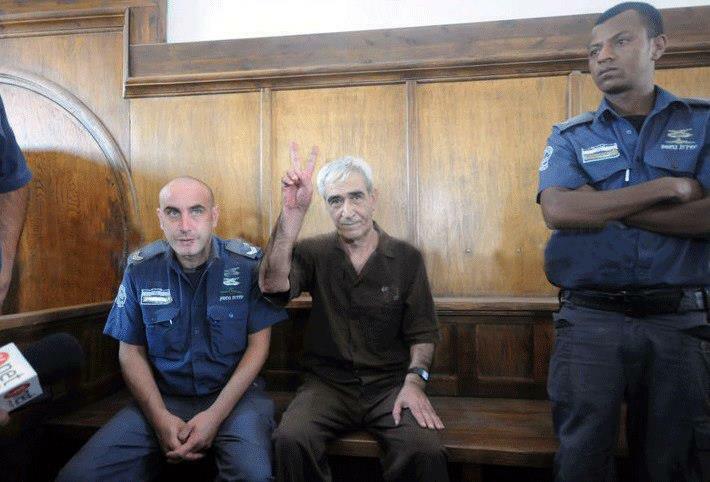 Imprisoned Palestinian national leader Ahmad Sa’adat reiterated his position that he does not recognize the authority of the Israeli occupation courts over Palestinian prisoners at the Magistrate’s Court in Jerusalem on Sunday, September 9, 2012. “I will not recognize the legitimacy of this court which is attempting to perpetuate the occupation of our Palestinian land, and is itself one of the fronts of Zionist terrorism against our Palestinian people, and a tool of repression against Palestinian prisoners,” said Sa’adat. Sa’adat was brought to the court for international proceedings in a private lawsuit filed in the United States by Shurat Ha-Din (the Israel Law Center), a Zionist legal organization committed to “lawfare” against Palestinians. This lawsuit seeks to hold all major Palestinian institutions financially accountable for deaths of Israelis who also hold Western nationalities. This lawsuit has earlier sought to bring other Palestinian prisoners and national leaders, including Marwan Barghouthi, to its Jerusalem hearings and compel them to testify. 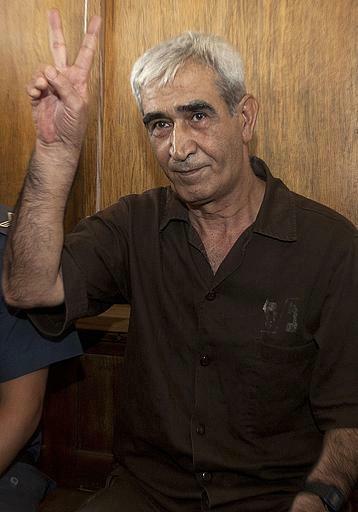 Sa’adat, the General Secretary of the Popular Front for the Liberation of Palestine, had been held in isolation for over three years, since March 16, 2009 and was returned to the general prisoner population only after the May 2012 agreement that ended the mass hunger strike in occupation prisons. His isolation was one of the major sparks of the earlier September-October 2011 hunger strike, which included hundreds of Palestinian prisoners. Mahmoud Hassan, director of Addameer’s legal unit, said that the Prison Service Guards transfered Sa’adat from Shata prison to the court against his will, and that Sa’adat continued his rejection – stated multiple times during his own trial – that he did not recognize occupation military courts as a legitimate authority. At the close of the hearing, Sa’adat directed a number of statements to the judge, calling for Israeli and American war criminals to be tried for their crimes against the Palestinian people. He said that the practitioner of terrorism in the region is the occupation, while Palestinians have a just cause and will obtain their rights. “If the United States is so interested in human rights and fact-finding they should carry out their investigations into finding the murderers of American solidarity martyr Rachel Corrie who was killed by the forces of the Occupation, instead of attacking the resistance and calling it ‘Terrorism’…terrorism, is the practice of the Occupation and the forces of Occupation. The resistance is legitimate, will continue, and will grow as long as the occupation exists. I trust the Palestinian people,” said Sa’adat. Sa’adat’s wife, Abla, his son, daughter-in-law and granddaughter came to see him at the court; the Prison Services guards prevented him from touching his granddaughter, Mayar. Addameer, speaking about the Shurat Ha-Din case, said that “these trials are part of Western and Israeli efforts to criminalize the legitimate resistance to the occupation and label it as ‘terrorism,’ and constitute blatant transgression of international law and the principles of international humanitarian law. Lakhdar Brahimi (L), Joint Special Representative of the United Nations and the League of Arab States for Syria meets with United Nation’s Secretary-General Ban Ki-moon in New York in this handout photo supplied by the UN Aug. 24, 2012. DUBAI (Reuters) — New UN-Arab League envoy for Syria Lakhdar Brahimi will visit Iran, a staunch ally of Syrian President Bashar Assad, after a fact-finding trip to Syria itself, an official in the Iranian Foreign Ministry was quoted as saying on Sunday. Brahimi, a veteran Algerian diplomat, succeeded Kofi Annan as envoy this month and has said he would talk to Iran as he tries to push forward with his difficult quest to end the 17-month-old conflict in Syria. In Geneva, Brahimi’s spokesman Ahmad Fawzi told Reuters that the UN envoy planned to visit Syria soon but there were no plans for travel to Iran. Brahimi was in Cairo on Sunday for three days of talks with the Arab League and Egyptian officials. Iran’s Mehr news agency quoted Iranian Deputy Foreign Minister Abbas Araqchi as saying Brahimi would visit Tehran, following a phone conversation Brahimi had conducted on Saturday evening with Iranian Foreign Minister Ali Akbar Salehi. “It is planned for Lakhdar Brahimi, the UN’s envoy to Syria, to travel to Tehran,” Araqchi said. Iran has remained loyal to Assad as he has tried to put down an uprising against his family’s 42-year rule. Tehran accuses regional states like Qatar, Saudi Arabia, and Turkey of assisting Syrian rebels fighting to topple Assad militarily. Iranian officials have said they will not support any foreign intervention in Syria, while Western states have called on Assad to step down. Brahimi’s predecessor Kofi Annan resigned in August after blaming “finger-pointing and name-calling” at the UN Security Council for hampering his efforts to broker a solution to the Syrian crisis. He too had said Iran should be involved in efforts to find a peaceful solution to the Syria crisis despite the West’s firm rejection of any such role.